Henderson, NV – August 5, 2014 – Aldec, Inc., announces the latest release of its mixed-language, advanced verification platform, Riviera-PRO™ 2014.06. This release extends Riviera-PRO’s already powerful visual mapping capabilities for UVM verification environments. Aldec introduces UVM Toolbox™ to interpret complex UVM verification environments into an easily readable, hierarchical format. With best-in-class SystemVerilog support and now more powerful UVM debugging environment, Riviera-PRO significantly increases the productivity of design and verification engineers. 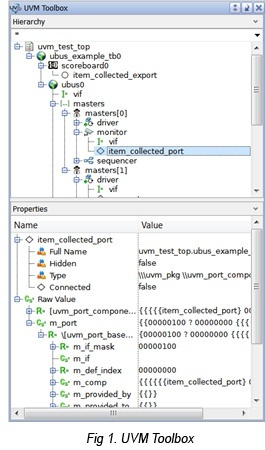 UVM Toolbox displays object properties for components selected within the hierarchy and is synchronized with UVM Graph, Class Viewer and HDL Editor features within Riviera-PRO to deliver a seamless debugging experience. The 2014.06 release of Riviera-PRO also includes numerous new features, enhancements, and performance optimizations. For additional information, tutorials, free evaluation download and What’s New Presentation, visit http://www.aldec.com/Products/Riviera-PRO.